Shiraz by Hentley Farm of Barossa Valley. The palate is layered with Barossa richness over a length of soft succulent tannins, supported by dark fruits and balanced acidity. The family Hentschke have been Barossa farming since 1842, they know from good soils and settle on nothing but the finest land. The fortuitous soils at Hentley Farm are predominately red clay loam over shattered limestone, salt and pepper siltstone over a layer of bluestones at greater depth. Lingering cherry and licorice add complexity, the balance of fruit intensity and oak through the back deliver a Shiraz of remarkable length. While the Hentschke family first settled in the Barossa Valley in 1842 and remained there for many generations, Hentley Farm founder Keith Hentschke grew up on a family property at Lameroo. 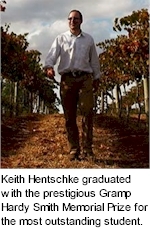 After studying Agricultural Science and Wine Marketing at Roseworthy College, Keith graduated with the prestigious Gramp Hardy Smith Memorial Prize for the college�s most outstanding student. Keith�s extensive experience within the wine and agricultural industry is the foundation of his belief that careful vineyard selection is the key to producing high quality wines. Keith Hentschke chose a special site along Greenock Creek, at the intersection of Gerald Roberts and Jenke Roads, in the ancient winegrowing hamlet of Seppeltsfield to plant vines in the early 1990s. With a focus on perfecting the vineyards, the first wines weren�t released from the property until 2002. Hentley Farm was planted in the early 1990s to Shiraz and Grenache, Cabernet Sauvignon, Zinfandel and a small parcel of Viognier. Blocks were carefully selected for orientation and aspect with different clonal material used according to suitability. The estate was extended through the purchase of the neighbouring high quality Clos Otto block in 2004. The depth and complexity of Hentley Farm wines arises from the great variety of terroirs, created by the diversity within the 150 acre estate�s east and west facing slopes and altitude variances. Subsoils of tightly structured friable clay offer huge water holding potential, offering respite for our vines in times of low rainfall. It remains essential to acknowledge the viticultural team's custodial responsibility for the land, are nurtured to their optimum potential through sound environmental practices that support agricultural sustainability and vineyard biodiversity. At Hentley Farm, environmentally sustainable dry land farming is the principle strategy, with an emphasis on keeping the vine and earth in a natural state of balance through minimal interference. The team at Hentley Farm endeavour to simply guide fruit from vine to bottle, allowing the unique characteristics of each vineyard block to shine through. As a result, Hentley Farm produces distinctive wines that display elegance, subtlety, depth and complexity. 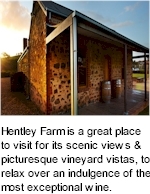 Hentley Farm remains faithful to the traditions of Barossa Valley, as originally settled by Silesian migrants in the early 19th century, who began the rich tapestry of the region�s mixed farming history. Many of the traditions of these early settlers are still celebrated by the Barossans of today, not least the food traditions of smoked meats, artisan breads and preserves. Hentley Farm is a great place to visit for its scenic views and picturesque vineyard vistas, to relax over an indulgence of the most exquisite gastronomy and exceptional wine.